Last month at the NYC Toy Fair we got a glimpse of the new grown up version of Dora the Explorer, who moves to the big city, attends middle school, and has a new, fashionable look..
She now had long hair, long legs and a was given trendy make-over. 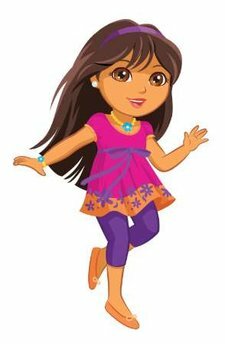 We received many e-mails from parents worried that the new that new tween Dora was not in keeping with the character’s outdoor, adventurous spirit and would prove to be a poor . As an online petition against the new ‘tween Dora began to build up speed,Nickelodeon and Mattel, the world’s largest toymaker, addressed these concerns and assured parents that Dora was not changing — and not going off the rails. “The award-winning preschool Dora character that audiences know and love is not changing at all,” Nickelodeon and toymaker Mattel said in a joint statement on Monday. Initially, Tweenage Dora was not to be revealed until the fall. But in response to all of the controversy a photo was released yesterday showing a young girl in flowered tunic, purple leggings and sandals. They said Dora would be solving mysteries with four new girlfriends related to the environment, wildlife and school. “This version of Dora — which is approximately modeled after a nine- or 10-year-old — is an age-appropriate doll that lets girls continue to learn and grow with the character,” they said. I like the whole Nancy Drew concept, but am not sure why a new character couldn’t be created.